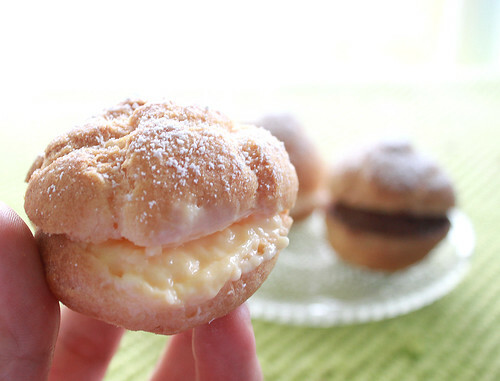 Profiteroles or also known as cream puffs are not that hard to make but just requires time especially if you have 3 different fillings to make. I’ve made a cream chantilly, vanilla custard and chocolate mousse for this round of batch. And to me, the chocolate mousse wins hands down! I used Nigella Lawson’s Instant Chocolate Mousse recipe as I had no time to chill it overnight and needed something fairly quick, and her recipe is oh-so-yum. I’ll definitely be using it again and pouring them into glass cups to indulge on its own! The choux pasty is so soft yet still holds its form and is super light which really compliments the ‘a bit heavy’ chocolate mousse. You can put whatever fillings you want really, some put ice cream and custard with fruits, then top it off with a dusting of icing sugar or chocolate ganache. 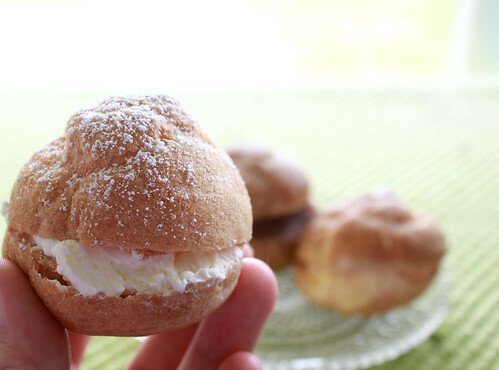 I have come across so many choux pastry recipes and have found the best. Not eggy or hard. The trick is not to use milk but water instead. 1. Preheat oven to 220° C. Line 2 baking sheets with non-stick baking paper. 2. In a medium saucepan bring water, butter, sugar and salt to a boil over medium heat, stirring gently with a wooden spoon. 3. When mixture begins to boil, add sifted flour all at once and stir vigorously until paste reaches pulls away from the sides of the pan and forms a big ball, about 1 minute. Remove from heat. 4. Allow paste to cool, stirring a couple of times, wait 3-5 minutes to cool. 5. Add the eggs one-at-a-time, stirring vigorously after each addition making sure each egg is well incorporated before adding the next. 6. Transfer choux pastry to a large pastry bag fitted with large plain tip (i.e. Wilton 1A). Pipe 4-cm high mounds, spacing 5-cm apart, on prepared baking sheets. 7. To prevent tops from burning, use your finger tip and dip in a little water and then lightly touch the ends of each puff. 8. Immediately place in the oven to bake (water will help to create steam which helps create volume in the puffs while baking). Bake until tops and sides are golden, 25 to 30 minutes. Turn off oven and allow puffs to rest in the oven for 5 minutes. 9. Remove from oven; poke each puff in the side with a small paring knife to allow steam to escape. Transfer to wire rack and allow puffs to cool completely before adding the fillings. 1. Combine milk, vanilla essence and cream in a small saucepan. Place over medium heat. Cook, stirring constantly, for 5 minutes or until hot (do not allow to boil). Remove saucepan from heat. 2. Whisk egg yolks, cornflour and sugar in a heatproof bowl until well combined. Pour hot milk mixture over egg yolk mixture, whisking constantly. 3. Return mixture to saucepan over low heat. Cook, stirring constantly, for 15 to 20 minutes or until custard thickens and coats the back of a metal spoon (do not allow custard to boil, as it might curdle). 4. 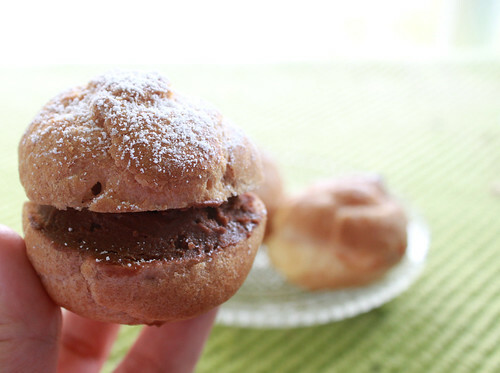 Leave to cool for about 10 minutes before adding into each profiterole. 1. Put the marshmallows, butter, chocolate and water in a heavy-based saucepan. 2. Put the saucepan over low-medium heat, to melt the contents, stirring every now and again. Remove from the heat. 3. Meanwhile, whip the cream with the vanilla extract until thick, and then fold into the cooling chocolate mixture until you have a smooth, cohesive mixture. 4. Allow to cool in the frige before adding into each profiterole. Mixture will start to thickened a bit. Your recipes are lovely. Just in timne for Ramadan.